LilNudists™ Cattery Orlando, Florida was featured in an exclusive spot on Fox 35 News. LilNudists™ Cattery was awarded the TICA Outstanding Cattery Award again in 2016! We also were granted a prestigious licensing at our Florida cattery location! 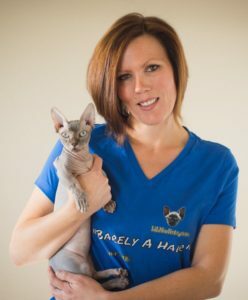 Selected as the only Bambino breeder to be interviewed on the production as well as given the opportunity and responsibility of educating the world about our fantastic new breed or hairless cats! The Sphynx cat is a hairless, long-legged, long-tailed cat. The Sphynx breed as we know it today can be traced back to the original bloodlines from two kittens born naturally in Toronto Canada. The Bambino cat is a hairless, short-legged, long-tailed cat. The Bambino breed was founded in 2005. The Bambino is the purposeful breeding between the Sphynx cat and the Munchkin cat which is a breed of cat with the natural, spontaneously occurring gene for short legs. The SphynxieBob is a hairless, long-legged, bob-tailed cat. The SphynxieBob was founded and established as a new breed by LiLNudists Cattery. The SphynxieBob cat is produced from the purposeful breeding between a hairless Sphynx and an American or Domestic Bobtail cat. The BamBob is a hairless, short-legged, bob-tailed cat. The BamBob was founded and established as a new breed by LiLNudists Cattery. The BamBob cat is produced from the purposeful breeding between a hairless Bambino and an American or Domestic Bobtail cat. 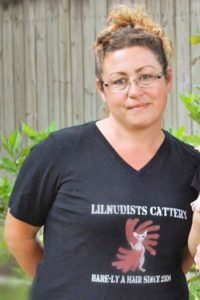 LiLNudists Cattery was founded in 2006 with the goal of producing beautiful, breed standard, healthy, loveable companions, and cherished family members! April is always here to support our past, current, prospective, and future kitten adopters! She now offers online cat health and behavior consulting services to help keep these kitties healthy as possible. Located in Northern Virginia, about an hour west of Washington, DC, she holds a Bachelor of Science degree in Animal Science from California State Polytechnic University, and a minor in Animal Behavior. Jayme has over 20 years of breeding, showing and training experience. Having produced over 25 Champions worldwide. 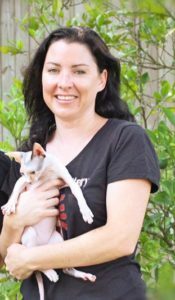 Wendy first became involved with the hairless cat breeds with her daughter, April when she began breeding them in 2006. She raised not only beautiful, healthy, breed-standard kitties; but babies who are well-socialized and lovingly prepared for their forever homes. Kittens are raised in their home, and are introduced to many different situations, so they are well socialized when before going to their new homes. A graduate of the University Inter-Americana of Puerto Rico, Dolly comes from a family of breeding experience. Mentored by April and Wendy Arguin, she and her husband raise kittens with loving care. All of Amanda's kitties are well socialized as her husband and two boys are an extremely excited team! Theye are over-the-moon passionate about raising happy, healthy, beautiful kitties for others to love and enjoy! A California native, Melissa owns a small farm here in California where she grows her own veggies, rides horses and raises a few other farm animals. Melissa strives for happy and well socialized kitten personalities, excellent confirmation and above all, healthy bloodlines. "Couldn’t be happier with my choice of breeders..."
"This was my first time adopting a pet through an actual breeder and I couldn’t be happier..."
Join LiLNudists Email Newsletter for Hairless Cat fun! 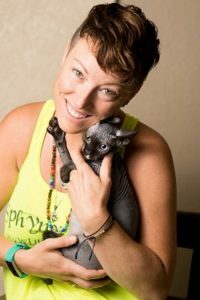 Educational info/videos, discounts on NudieNaturals Hairless Pet products, Cat Health Coaching Sessions, Pet Supplements and more!